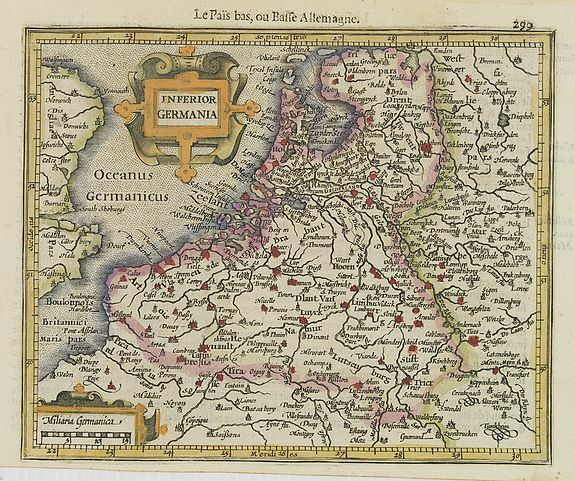 MERCATOR,G./ HONDIUS,J. - Inferior Germania. Inferior Germania. - MERCATOR,G./ HONDIUS,J. Size : 5.7 x 7.0 inches. / 14.5 x 17.8 cm. Description :Small map of the Netherlands, Belgium and Luxembourg with strap work title cartouche and scale of miles cartouche. Condition : Some age toning of the paper. Lower margin short as issued. Else good condition.